Showing horses on the AQHA circuit is incredibly competitive – and equally as expensive. And with rigorous training, travel, and competition schedules, it can be very difficult on the horses who may get worn out physically and mentally. Issues with attitude, willingness to train, and competition were all faced by top AQHA breeder and trainer Nancy Sue Ryan. 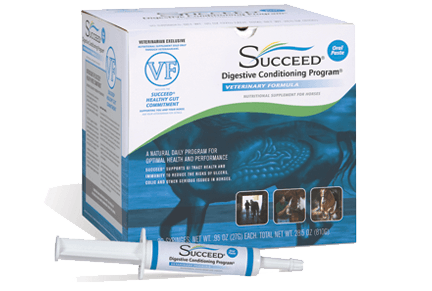 Listen in as Nancy, owner of Show Stop Farm with multiple AQHA World and Congress titles to her and her horses’ names, talks about how she manages her horses’ mental and physical health by using SUCCEED® Digestive Conditioning Program® (or read the highlights below). Nancy first heard about SUCCEED® in January 2005. At the time, she had a difficult gelding in her barn who was very anxious and nervous. She says he was constantly grinding his teeth, pinning his ears and showed hatred of both his job and the show pen. After picking up some literature on SUCCEED®, she and the gelding’s owners talked it over and decided to try SUCCEED® for three months. This year, Nancy also started giving SUCCEED® to her foals prior to weaning and broodmares 60 days prior to foaling and throughout the time they are nursing. She says that she recommends SUCCEED® to anybody who wants to be competitive at the horse shows. 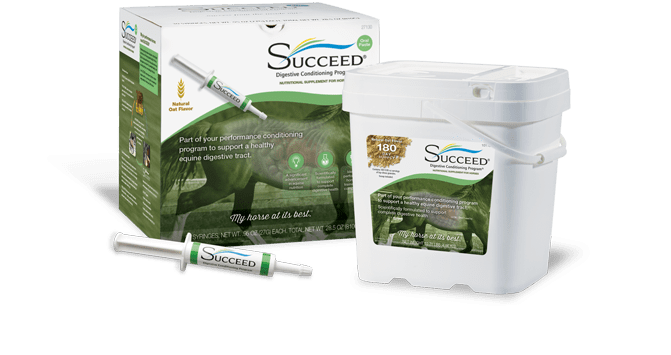 Do you have a story to tell about how your horse’s health, attitude, or performance (or maybe all three) improved with SUCCEED®? We’d love to hear it!